Like other Augustinian structures built in the late 18th century in the Philippines, the San Miguel Arcangel or St. Michael the Archangel Church of Argao is an edifice of impressive dimensions. This structure set in stone is 72 meters long, 16 meters wide, and 10 meters high. It is adjacent to the Argao town plaza and other Argao heritage structures like the Casa Real, Capilla Mortuario, Paso or Way of the Cross wall, and Hall of Justice building. With its vaulted wooden ceiling that covers a simple nave and a transept that gives it a cruciform shape, the Argao church is typical of other Spanish colonial churches in the Philippines. The Saint Michael the Archangel Church and its belfry, in this photo taken from the Argao church’s courtyard. The completion of this present-day Argao church can traced back to 1788, said the book Balaanong Bahandi, citing Archdiocesan Records. Although another historian, Pedro Galende, attributed the current structure to Fr. 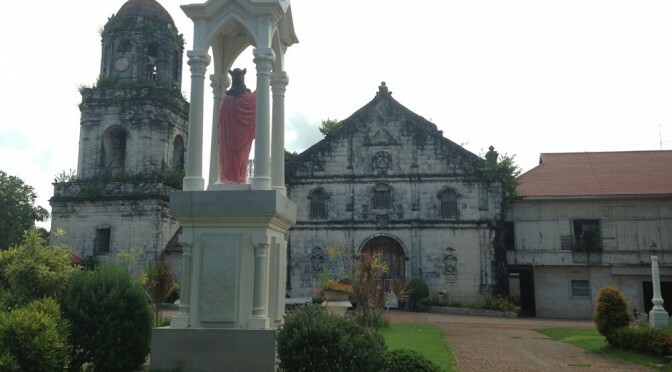 Mateo Perez, which served as parish priest for 33 straight years from 1803 to 1806, the date “1788” engraved above the arch of the Argao church’s side door indicates it may have been completed during Fr. Francisco Espina’s time from 1782 to 1798, the book added. Argao was one of eight vicarages established in 1599 and, while it became a town or mission pueblo as early as 1608, it was only set up as a parish over a hundred years later or in 1733, said the Balaanong Bahandi, adding the reason for this oversight was never adequately explained. Originally, the San Miguel Arcangel Church had the typical Spanish clay tiles for its roof but this collapsed during the typhoon of November 25-26, 1876, wrote Gerschwiler. He said Argao native Msgr. Pablo Alcarez narrated that the tiles were replaced with galvanized iron in 1924 due to fear of earthquakes. The church facade is a horizontal rectangle topped by a triangular pediment and divided into nine panels, a style that can be found only in five of over 160 documented Augustinian churches and all of them built along the southeastern coast of Cebu, according to Gerschwiler. What distinguishes the San Miguel Arcangel Church, he added, is the high artistic quality and symbolism of its masonry, although Augustinian records had failed to identify many of the master carver-artists behind the structure’s artistic ornamentation. It is clear from their work they were masters of their crafts, itinerant Chinese and Chinese-mestizos who were familiar with Christian themes and motifs as well as early Christian symbolism, according to Gerschwiler. An example of such one-of-a-kind feature, he noted, is the four pairs of half columns that run up to the pediment and divide the facade into three panels. “On the first level the paired columns stand on rectangular pedestals. The two outer pedestals depict lions sitting on their hind legs, holding a ball in each of their paws; a very typical Chinese motif,” wrote Gerschwiler in his historical outline. The two pedestals flanking the main door each depict a bird, with its head down and wings spread out protectively, nursing three of its young that cling to their mother’s breast, he added in his description. Rich and elaborate ornamentation can be seen in the way the double cornices that horizontally divide the facade create an entablature when it intersects with Corinthian capitals richly decorated with floral motifs; atlante-angel carvings carry the paired half-columns running up to the pediment; a stylized peacock sits atop an orb; sequence of carvings of angels, fruits of the ivy, and a little snake run down the columns. An example of the bas reliefs of angels and other Christian symbols that adorn the Argao church’s facade. “In a cascade if motifs, the artist carved his message…(he) thought this particular message to be so important and essential that he repeated it with slight variations on all half-columns of the first level, no less than eight times,” Gerschwiler said. Four of the nine panels in the front face are particularly prominent, including the central panel of the pediment where St. Michael the Archangel, armed with spear and shield, and flanked by two angels – one carrying his standard as light bearer and the other holding the Tuba Christi of the Last Judgement – is depicted. Its massive front and side doors made of vertically joined hardwood planks are integrated with smaller semicircular doors and decorated evenly with bronze rosettes embedded on the wood. The church, according to the Balaanong Bahandi, has been the recipient of Baroque and semi-Rococo embellishments like its wooden pulpit and its pipe organ in the choir loft. A wooden retablo of majestic proportions dominates the altar section but this has unfortunately been unnecessarily gilded, including even the centuries-old life-size estofado statues of saints enthroned in its niches, added the book. There are five altars or retablos inside the Argao church. The main one, which a priest decided to paint gold, has neo-baroque influences, said Gerschwiler. This altar has four niches: the lower level contains statues of the archangels St. Michael (center), St. Gabriel (right), and St. Raphael (left) while the center enshrines a sculpted image Center of the Virgin Mary. Gerschwiler said the church’s pipe organ is one of three that remains in Cebu. It was believed installed in the second half of the 19th century and, although Mexican in design, used local materials so it was probably built locally, he wrote. Argao church’s pipe organ has a total of 700 pipes and provided the organist with 22 different timbres, he added. According to him, only the murals on the apse and transept of the vaulted ceiling can be attributed to famous 20th century Cebuano painter Raymundo Francia. The four scenes span the whole width of the nave and transept at their crossing point and depict the battle between the fallen angels of Lucifer and the good angels of St. Michael, the temptation of Adam and Eve, and the fall of man. One scene can’t anymore be discerned. There are two other altars with four semicircular statue niches with round arches bearing ornamentation of Chinese influences and Moorish arabesques. He described the pulpit as made up of rectangular recessed planes angled against each other and on them are painted wooden reliefs of (in clockwise direction) evangelist St. Luke, the evangelist St. Mark, the Virgin Mary, the evangelist St. John, and the evangelist St. Matthew. Church historian Galende describes the three-level campanario or belfry erected in 1830 as “one of the best in the Philippines.” It rests on a solid and thick wall base and has small rectangular openings. It used to house nine bells and the earliest one brought there, Santa Barbara, was founded in 1875.